More Murderbot! If you enjoyed All Systems Red then you will enjoy this new installment in the continuing adventures of Murderbot. 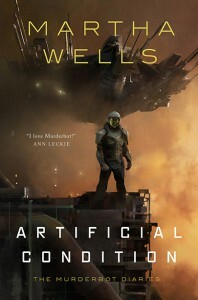 Using the same snarky and awkward voice we've come to love, the Murderbot gets a little more information on its history and meets some new characters along the way. I particularly enjoyed ART and their interactions. I was worried the sequel might not be able to recapture the unique feel established in the first novella, but this did not disappoint. Intriguing, insightful, and funny, these stories are now officially among my favorites. I look forward to joining Murderbot on many new adventures in the future!